Christmas has become too commercialized. Since when did it become bigger than birthdays? Not everyone enjoys it either. So much guilt is generated around this holiday. Not everyone gets along with their family or wants to spend time with them. I really don’t want my kids to feel obliged to visit me for Christmas. As much as I love my kids, if they want to be somewhere else, then fine. I would rather not guilt trip them about it and see them when they are happy to come around of their own accord. I haven’t spent Christmas with my parents for years. I don’t even live in the same country as they do! Are they alone? No! Granted, the holiday isn’t the same without me…hehe! Sure, I like decorating the house and giving gifts. But when did the gift giving be the all important aspect of Christmas as it seems to be today? What pressure there is in these austere times for parents to ‘give’ to their kids when many are struggling to pay the bills. It would be really interesting if the kids told their parents not to worry about a present this year because they know it hasn’t been easy since mom or dad got laid off from work ( or any other scenario where a family is struggling). I somehow don’t see that happening. When my children asked me what I wanted for Christmas, I honestly couldn’t think of anything. I have all the ‘stuff’ that I really need, as well as stuff that I don’t really need. When I asked my sweetheart what he wanted, he couldn’t think of anything he wanted either. When he asked me what I wanted, well, I couldn’t think of anything. I don’t need anymore diving equipment, or art supplies right now. I don’t need clothes or shoes or handbags. I don’t need furniture or accessories. I haven’t seen anything that jumps out at me and screams, ‘buy me!’ There isn’t anything that I really want. I would rather save the money for a great night out or a holiday. In this run up to Christmas, I have had some free time on my hands to get ready for the big event. Actually, it is in two parts as my daughter will be away for Christmas and so she came to visit me this past weekend. I spent the week before running around like a mad woman getting all the shopping and decorating done before she arrived. It was exhausting. The upside to that is I don’t have to run around like a mad woman this week before my son comes down for Christmas Part 2. What I enjoyed most about spending Christmas Part 1 with my daughter was the fact that she was here and I got to spend some time with her. Sitting with my family at the dinner table is more important to me than presents. Sharing time and making memories can’t take the place of a new sweater or any other item. I am really looking forward to Christmas Part 2. I haven’t seen my son since August as he has been away at University. I could care less about a present. All I really want is to spend time with my family and loved ones. I hope you all have a wonderful Christmas Holiday! Cranberry Sauce – Make Your Own! Cranberry Sauce is one of the easiest things to make. It is also fun and it makes the house smell nice! In the UK, cranberry sauce is readily available in small jars all year-long. That wasn’t always the case, so when I would find fresh cranberries in the supermarket, I would always make my own. The best thing about making your own – you can make it just the way you like it, and there are so many different ways to make it. 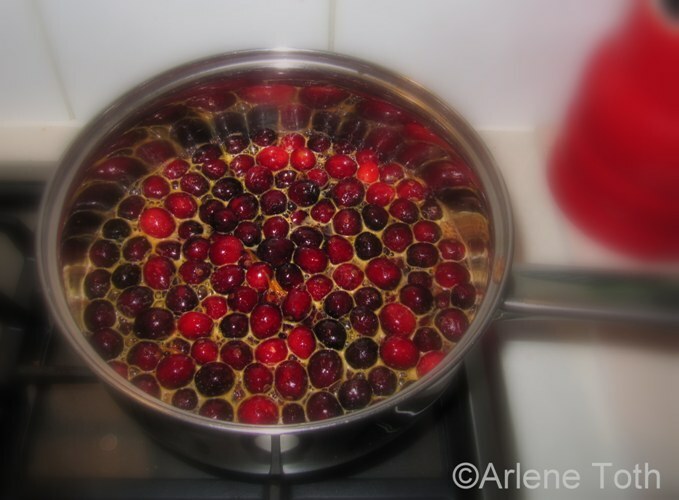 Wash the cranberries and get rid of any mushy ones. Pop them in a medium-sized saucepan. Add 1 cup of sugar to the cranberries (you can use less or more according to taste, but you need the sugar to help set the cranberries and make it last in the fridge, like jam). Zest your orange and then cut the orange in half and squeeze all the juice in. Make sure to remove any pips. Add 1 small stick of cinnamon. Top up with enough mulled wine so the cranberries can float a bit. Put the heat on medium high. When it starts to boil, turn down the heat so that it is on a gentle simmer! It should look like this! Don’t worry about any foam around your cranberries. That will be from the zest and will disappear. Look how pretty they are, like little rubies! Now for the fun part, the kids will like this! Stir your cranberries now and then and listen to them pop. You should see little splits in the berries with the white insides popping out. It is sort of like watching popcorn. All the berries need to cook and pop. If after about 5-10 minutes there are still some that haven’t popped, just get a wooden spoon and pop them on the side of the pan. The berries need to pop so that they can sweeten up and help make the jelly. I like to get the wooden spoon and give them all just a little extra squeeze. You will start to see that the juice will go translucent. This means that the sauce is ready to put into containers. By the way, I like cranberry bits. If you want more of a jelly, then strain the fruit mixture through a sieve and dispose of the skin. Don’t forget to remove the cinnamon stick! 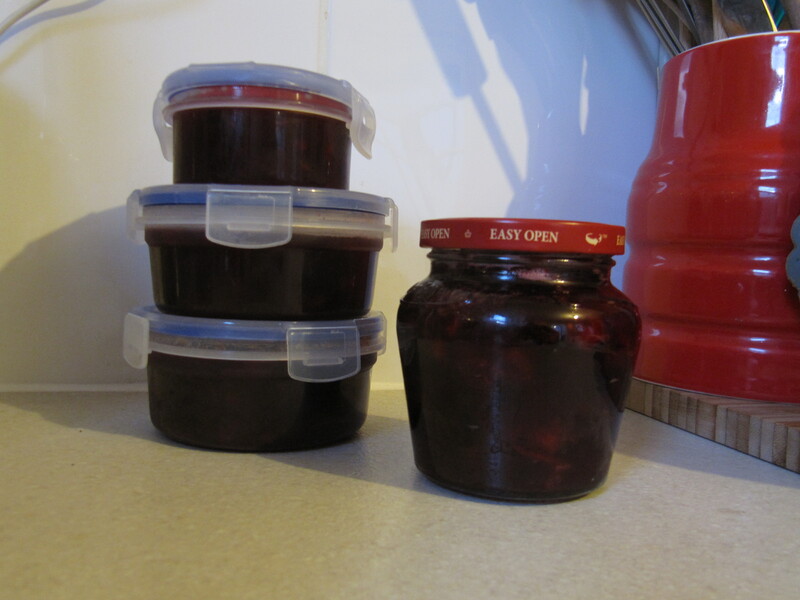 I try to re-use jam or condiment jars just for making cranberry sauce. Make sure they are very clean. When you are ready, fill up the jar with the cranberry sauce and put the lid on while still hot. The lid should seal itself once the sauce starts to cool down. If you don’t have any glass jars, plastic containers will work too. I haven’t had a problem with the sauce going off before Christmas, but you might want to check it before you eat it. If there is too much air in the container, it might not last as long. I only had one jar which I am taking up to my daughter and the rest were put into small plastic containers with rubber seals. Cranberry sauce is a great accompaniment for red meat, any fowl, and even vegetarian meals. I particularly like it with leftover turkey and stuffing sandwiches! Have fun! I wouldn’t mind hearing other ways of making cranberry sauce. What is your favourite?